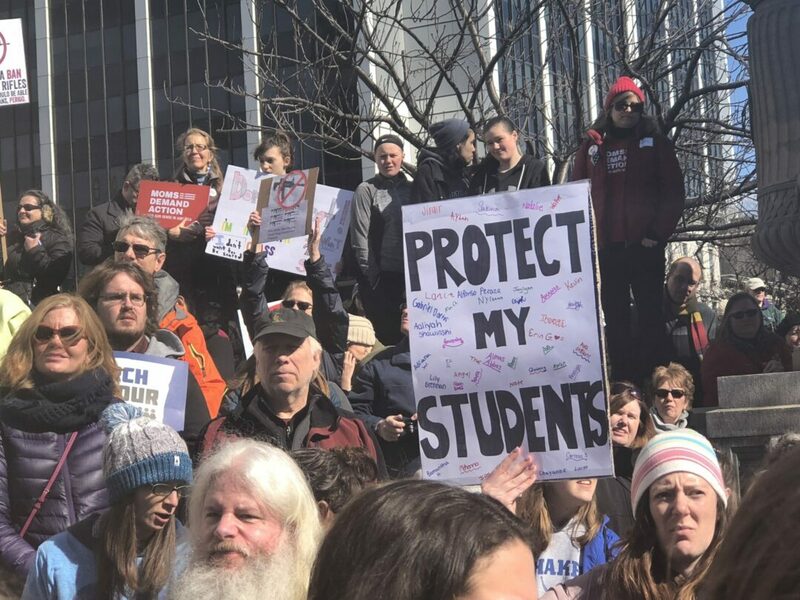 ALBANY—Flanked by the State Education Department, the Capitol and state legislative and justice buildings, thousands of students gathered on the west lawn of the Capitol building and, along with parents, teachers, public representatives and advocates, called for increased gun control regulation on Saturday, March 24. The #MarchForOurLives rally was held in solidarity with students and others across the nation who feel that the disproportionate amount of school shootings that occur in the U.S. would be mitigated under laws that expand background checks, make it easier to disarm potentially violent gun owners, and ban assault-style weapons. The event was announced by students from Marjory Stoneman Douglas High School just four days after the Valentine’s Day shooting that took the lives of 14 students and 3 teachers. Speakers noted that less gun violence tends to occur in places with greater regulation, spoke of the impact that school shootings have had on contemporary students, challenged the idea that the Second Amendment is carte blanche to carry any type of firearm, and encouraged each other to make it to the polls in November and keep up the current momentum. “You have re-inspired me, you have re-inspired every parent, you have re-inspired your teachers and administrators and every elected that is here,” said Assemblymember Pat Fahy (D-109) to the students who organized and participated in the event. She acknowledged that past effort to increase gun control regulations have been consistently met with opposition and failure, but she also pointed out that New York state is the third safest (in terms of gun violence) state in the nation, and carries some of the most stringent regulation. “We still have so much more to do,” she said, encouraging those present to keep fighting.